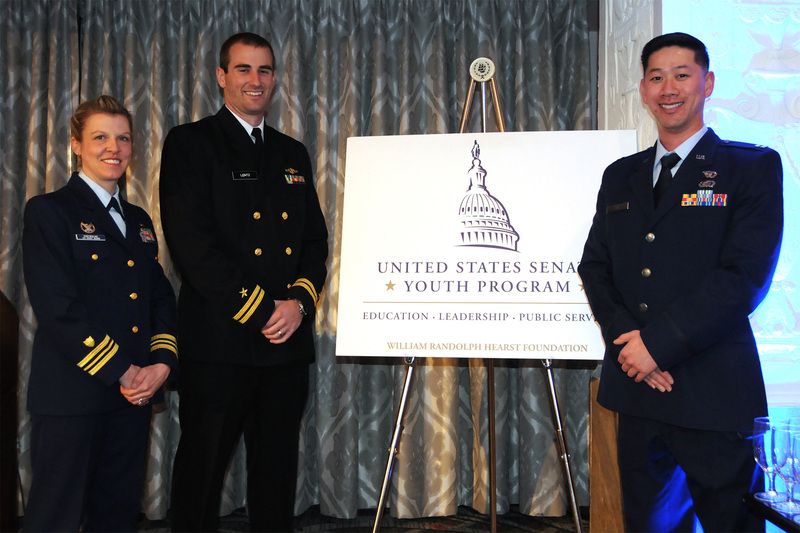 WASHINGTON (March 08, 2019) -- For Navy Lt. Bradley Lentz, this is the second time he's spent a week here as part of the U.S. Senate Youth Program. This time, he served as a mentor for the program. The first time, he was a high school participant. "In 2009, I applied for the program as a student, and I was accepted," said Lentz, who today is assigned as an ROTC instructor at the University of South Florida in Tampa. "It was a phenomenal experience -- one of the most exciting experiences of my life. I got to see all branches of federal government, and I was really inspired to a career in public service after that." Coast Guard Lt. Cmdr. Megan Drewniak, Navy Lt. Bradley Lentz and Air Force Capt. Patrick Lin served as mentors during the 2019 U.S. Senate Youth Program, which ran March 3-8, 2019, in Washington. Like Lentz a decade ago, some of the brightest high schoolers from around the country wrapped up a weeklong visit to the nation's capital today as part of the Senate Youth Program. Among those students -- 104 in all -- are two from each state, two from Washington, D.C., and two representing Department of Defense Education Activity schools. Their week in Washington was an opportunity to learn about government, democracy and in particular, the U.S. Senate. During their time here, they didn't just visit tourist locations -- they met with and interacted with the government executives, leaders and elected officials who run the federal government. Among those on the itinerary were President Donald J. Trump, Sen. Joni Ernst, Sen. Richard Blumenthal, Secretary of State Mike Pompeo, and Chief Justice of the Supreme Court John G. Roberts. On Friday, the 104 "delegates," as they are called, were able to visit the Pentagon for lunch and to hear from and meet with David Norquist, who is performing the duties of the deputy secretary of defense. The secretary told the youth he'd done a trip similar to theirs when he was in high school. "I do remember that from that week and from that trip, I found how much interest I have in what was going on in D.C.," he said. "So, 30 years from now, it doesn't matter if you remember me or you just remember a guy with a tie, but if you find this week inspiring, and you find the kinds of things happening in D.C. exciting, and you make a career of it -- then this will be worthwhile." Norquist also told the students that there are opportunities across the federal government for whatever career choice they might be interested in. 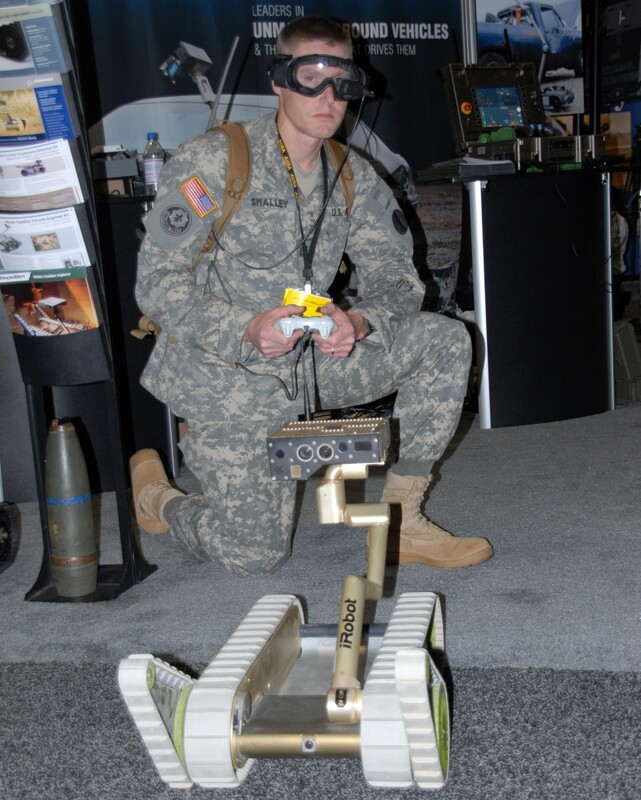 The DOD in particular, he said, has opportunities for whatever kind of career they might choose. After remarks, he took questions from students on a wide array of topics, including budget, how the department makes decisions to enter into a conflict, and how DOD and the United States can work to prevent future conflict. 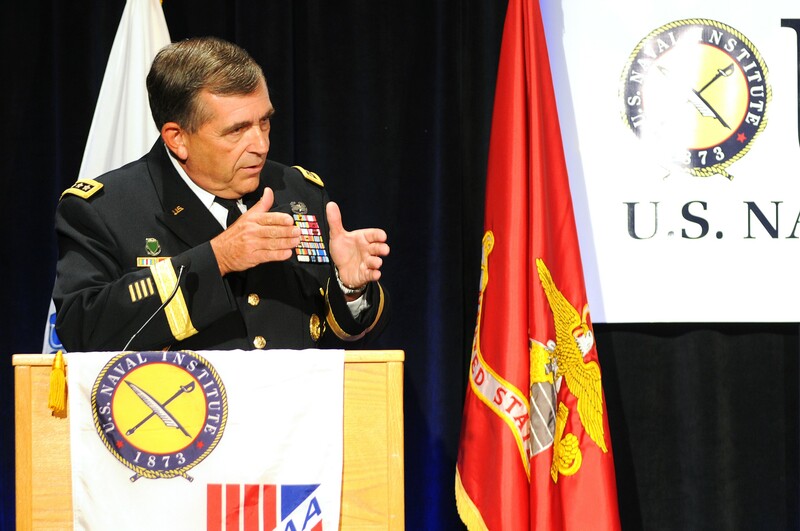 Military officers from all branches served as mentors and guides on the trip, each shepherding a group of about eight delegates, to make sure nobody missed out on an opportunity to engage with and learn from some of the nation's most important leaders. But those officers were also there to impart their own wisdom, hoping to enlighten the students about the value of public service. 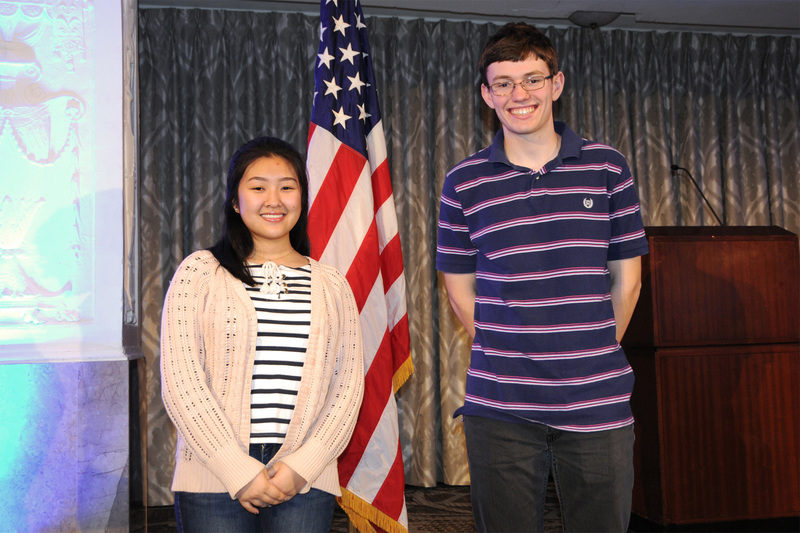 Shannon Ryu, a senior at Seoul American Middle High School, a Department of Defense Education Activity school in Seoul, South Korea, and Daniel Posthumus, a junior at Nile C. Kinnick High School, a DODEA school in Yokosuka, Japan, participated in the 2019 U.S. Senate Youth Program in Washington. The program ran March 3-8, 2019, and included 104 students. "I want the delegates to learn that the stereotypes of military may not all be true from what they see in the popular culture," said Air Force Capt. 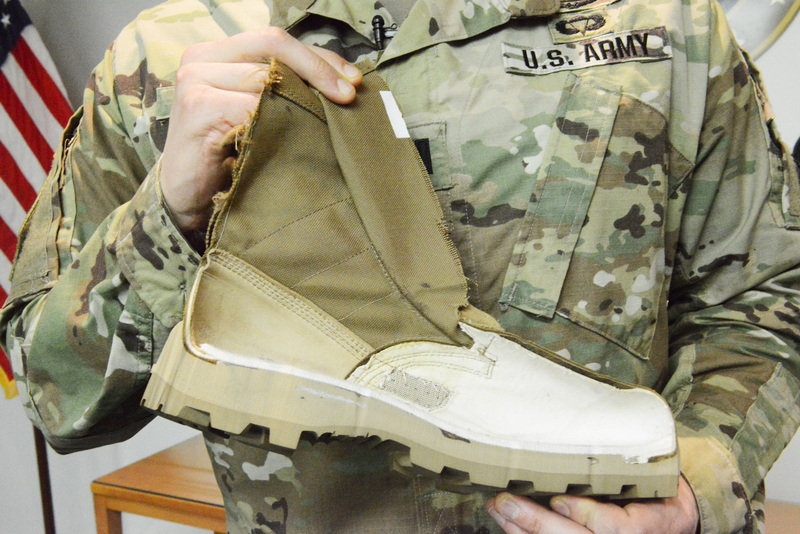 Patrick Lin, an engineer assigned temporarily as an intelligence officer at Ramstein Air Base, Germany. "We could be your neighbors, with similar values from where you come from. I'd like them to be able to be able to relate better to the military service members that they'll hopefully get to work with in the future." The Senate Youth Program was created in 1962 by a resolution passed in the Senate "to increase young Americans' understanding of the interrelationships of the three branches of government, the caliber and responsibilities of federally elected and appointed officials, and the vital importance of democratic decision making not only for America but for people around the world." 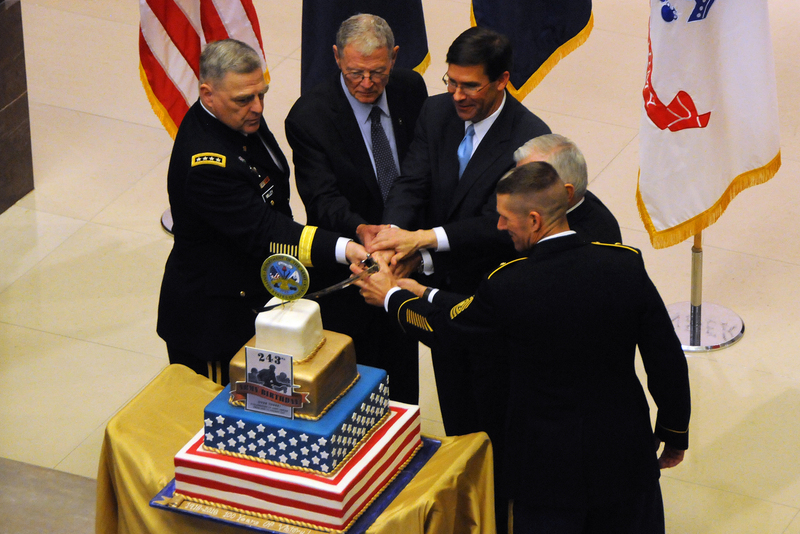 The program is now in its 57th year, and Coast Guard Lt. Cmdr. Megan Drewniak, with the USCG Marine Safety Unit in Toledo, Ohio, said she can see why exposing students to government is beneficial to not just those who participate, but to America as a whole. "Being educated, and being able to make informed decisions is important, particularly in this day and age, during a somewhat tumultuous time," Drewniak said. "So, I think the more that young people are exposed to really how things work, how they can work, bipartisan relationships, things of that nature, I think the better off we will all be. We'll all be in really great hands if some of these young folks continue to move up in the world." Shannon Ryu is a senior at Seoul American Middle High School, a DODEA school in Seoul, South Korea. She's currently serving as her senior class president and president of the National Honor Society. She said that at the start of the Senate Youth Program week she was overwhelmed by the large number of speakers, but excited at the prospect of meeting government officials that she'd only read about. "There aren't any words to describe how excited I am to listen to all the speakers on the list," she said. "But particularly, I am looking forward to meeting Chief Justice of the Supreme Court [John] Roberts. I think that is one branch of government that I don't really know that much about compared to the executive and the legislative branches. I really want to see how checks and balances play out in the judicial branch, as well as just how the Supreme Court works." Daniel Posthumus, a junior at Nile C. Kinnick High School, a DODEA school in Yokosuka, Japan, serves as student council treasurer at his school, and is also the president of the Spanish Honor Society and a member of the National Honor Society. He said he has an interest in politics and public service and thinks Washington will be a great place to learn things about democracy that can make anybody a better citizen. "I think that Washington, D.C., is where most of our democracy takes place, so I think if we have a good idea of what happens in Washington, D.C., then by extension, we must have a good idea if what happens in our democracy," he said. "I think that's really necessary for a healthy democracy. I think sometimes you have voters who may not understand how government works and may not understand the responsibilities of the citizen." Posthumus said he thinks a responsibility of citizenship is to understand how government works, and that Washington is a place to see it happen. "This will help us become better citizens and better use our knowledge to vote for the candidates who we think can make positive change," he said.